I'm told the dead are all around us. I wouldn't know about that - I see only the violently slain. They can be victims of a hit-and-run, innocents caught in a crossfire, or the murdered. They whisper to me, and they never, ever, forget the face of their killer. The departed aren't the only supernatural things I see. No, they're not vampires or werewolves or fae - those things don't exist. We live side by side with what some call the Otherworldly, but that's too much of a mouthful for me. I call them demons. If you saw them as I do, you'd know why. Right now I'm trying to track down a missing six year old boy whose mother was murdered. Or was she murdered? To further complicate the case, Clarion PD gave me a partner I would rather shoot than work with. I can't tell them he's a demon. I'm Tiff Banks. Welcome to my world. Okay, so he didn’t make me write the first novel of the Whisperings series, in fact quite the opposite, but he was the catalyst. If not for my husband, Along Came a Demon might never have been written. Each of my books began with the idea for a character, with little or no notion of a plot. I agree with authors who say their protagonists take control of the plot. Once that character was firmly established in my mind as a real person, plot ideas and a cast of supporting character just popped into my head, usually at inconvenient times, such as when I was just about to fall asleep or was miles away from my computer. As most of my protagonists tend toward contrariness, they would choose awkward times to let me in on their stories. The idea for a character who saw and interacted with the dead as actual people, not amorphous shapes or the knock-once-for-yes, knock-twice-for-no variety, floated around in my head six or seven years ago. I knew my heroine would need a way in which to differentiate between the living and dead, so she would hear their voices as whispers. And because I didn’t want the poor woman to be surrounded with dead people eternally pestering her, I decided she would see only those who died violently. And that is where that idea remained, in my head, until early 2009. I had written two science fiction novels that my husband was most reluctant to read them. He does not read science fiction, so I imagine he did not want to wade through mine and have to tell his own wife he did not care for her book. You can imagine, perhaps, how that chaffed my ego. But he was reading novels with paranormal themes. So, I thought, right, I’m going to write one you can’t ignore! Tiff Banks and her world came to life. Putting a little more thought into that old concept, I decided my heroine had to stand out in the crowd, so she became a tall, pale skinned woman with silver-white hair which, incidentally, makes her a startling contrast to the darker-skinned, metallic-haired demons (Gelpha) with whom she interacts. I still did not know everything about Tiff Banks when I wrote Along Came a Demon. How did she come by her abilities? Why is she rather uptight, and definitely distrustful of other people? Will her slightly mysterious past be explored? As the series developed, some of those questions were answered in The Demon Hunters and Demon on a Distant Shore. Having more or less decided on the central protagonist, I needed a location and, took the easy route. I’m familiar with all the locations in Along Came a Demon, and in particular Tiff’s hometown city of “Clarion,” although I did transport this Utah city up into the mountain valley in which I now live. The setting had an influence on the Tiff Banks character, because when you live high in the mountains you do not wear skin-tight leather outfits, micro skirts or stiletto heels, therefore neither does Tiff Banks. She dresses for the climate. She is not chick-lit. As for the supporting cast, I knew I wanted a supernatural people who could be both enemies and friends, and there were the Gelpha, just waiting to be discovered. Tiff is one of a small number of people who perceives their true appearance; their metallic hair, gleaming eyes and pointed teeth. Ghosts would not only play a part in solving criminal cases, they would be Tiff’s friends and confidantes, and there were Jack and Mel. For a glimpse into Tiff’s world, I encourage readers to take a look at my fReado page and the BookBuzzr widget, a most marvelous marketing tool for writers. More insights can be found on my web site: www.lindasworlds.net. Along Came a Demon was also, for me, an experiment in writing. I used a casual style of writing, the idea being that Tiff is speaking directly to the reader, using her her own words, phrases and pace. Sometimes she cracks jokes or teases the reader. As my education in writing was of the formal type – which stands me in good stead in office work but not when writing a novel – I was constantly telling myself, “No, you can’t write it that way!” then changing it, then changing it again, then blocking out what my brain told me and giving in to gut feeling. As I am a Brit living in the USA, I also have to pay attention to the difference between American English and British English. One British reader was quite shocked when I described a dress that, “just about covered her fanny,” as that word has different meanings in the USA and UK. On the other hand, when I gave a copy of my little children’s fantasy, Beneath the Oak, to my British nephew, I had to explain it would be better if he read the story to his five year-old son rather than use it to teach the lad to read, because the spelling is American. And, yes, my husband did read Along Came a demon (when I dropped it in front of him and said, “here, read, or else!”) and he liked it. 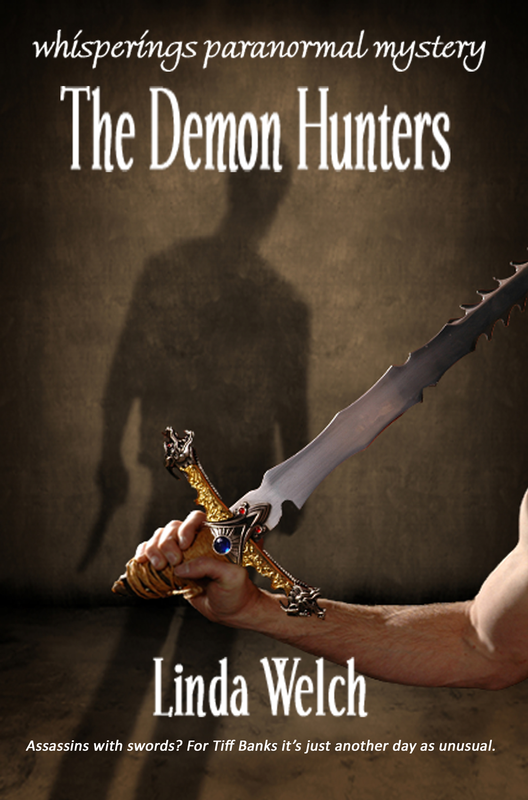 He also liked the sequel, The Demon Hunters, available from Lulu.com and coming soon to Amazon. Along Came a Demon is a real page turner. Tiffany, er I guess I should say Tiff, reminded me a bit of Kinsey Millhone. A no bones about it private eye, but at the same time very much her own woman. Intriguing story line, very descriptive, I feel like I almost live in Clarion. I like the genre, and read a great deal of mystery novels, but the metaphysical twist is really fun. Nothing like a Dean Koontz, (He is sometimes to far over the top) but still raised the hair on the back of my neck a few times. Thumbs up! I enjoy paranormals where the lead has psychic abilities that allow them to interact with ghosts so this novella fit the bill nicely. In it, the heroine has somehow in the past acquired the ability to talk to and interact with people who've been violently killed. They hang around as ghosts, but they usually can't move very far from the place where they were killed, so she moves to a smaller town, hoping there won't be as many of them as in the big city. Her psychic ability is a major part of her character and is an important plot device, but it isn't actually the primary focus of the book, The primary plot revolves around her ability to also see "otherworldly beings" that she calls Demons for lack of a better word that appear totally normal to most humans, but are very definitely non-human to her. This story has a little mystery, a little paranormal fantasy, a little romance - something for everyone. It moves along very fast. There were no dull parts. The author did a good job of setting up her world in a way that explained the basics, yet left you with enough questions that you'd want to keep reading. I definitely want to read her next story in this series (I'm not sure if it's another novella or a full-length book). I just hope it is released in Kindle format (I read this one as a pdf). Ok, I thought well I will give it a try. I read paranormal and mystery all the time. This book combined the 2 with a excellence such as authors like Charlaine Harris and MaryJanice Davidson. The characters are well developed and interesting. You want to know more about them. You can't stand that the book ends!! This book had a great plot and it was NOT one of those where you know what was going to happen! I hope that Linda will continue to bless me with her books to review! I look forward to the rest of this series!!! Tiff is a "psychic" that works for the police department. Her true power is that she can see and speak to the dead (murdered dead). She also has the ability to see "demons" in their true form. The book is nice read - she has two "dead roommates" and her new partner/possible love interest is a demon. I find that Tiff is a little uptight and hard. I like "Royal" the demon a lot more. I have been an avid mystery fan for much of my life. I read before going to sleep every night and the books that usually make up that reading material are mysteries of the cozy type. Agatha Christie, P D James, Elizabeth Peters, Ngaio Marsh, Sara Paretsky, Martha Grimes, and the list goes on. When I saw that Linda Welch had requested a review for her psi-fi mystery, Along Came A Demon, I leapt at the chance to read and review it. I was not disappointed. Tiff Banks, nicknamed the Ice Queen by the Clarion police department for her tall stature and ice blonde hair, works as a consultant for the police in murder cases. She has told them that she is a psychic, but in actuality, she sees dead people as flesh and blood and they whisper to her. Tiff, who hates to be called Tiffany because of the image that projects, was orphaned as a baby, grew up in a variety of foster homes, and always felt she was a little different than everyone else. Happier being by herself than with a group of people, Tiff left Utah as soon as she was able and went from place to place and job to job. Until, after landing in San Francisco, boom, out of nowhere she started seeing and being able to talk to dead people. She returned to Utah to the small town of Clarion in the hopes that there wouldn't be too many murdered people trying to get her attention. Unfortunately for her, she moved into a house where there were two ghosts in residence, as well as two who lived on her street. So much for trying to get away from them. I sighed and turned to lean against the counter. I would rather she were an escaped lunatic wandered into the neighborhood than what she really was. Although why she was wet on that chilly November morning was anyone’s guess. Tiff was trying to figure out how the naked woman came to be on her grass as usually, the dead are bound to where they passed. Lindy Marchant passed away in the apartments behind Tiff's house, and she is concerned about her son. Tiff promises to find out about her son so that hopefully, Lindy will leave her alone, as she doesn't want to live with a naked woman in her orchard. The only problem is that once she checks with the Clarion police department, it appears that Lindy Marchant had no son. Not willing to give up, Tiff requests to search the apartment. Under the refrigerator she finds a drawing by Lawrence, which is given to the police to goad them into searching for the missing child. So starts the twisted case which involves the missing child Lawrence, which blossoms into a nationwide case where over 200 boys born on November 9, 2002 had gone missing. In addition to being able to see the murdered, Tiff can also see the otherworldly, whom she had heard about from her psychic friend, Lynn. Lynn was trying to be ethnically sensitive when she called them the Otherworldy. That was too much of a mouthful for me - I called them demons. Not that I thought they were creatures from Hell - I didn’t know what they were or where they came from. They could be aliens from outer space for all I knew. But with their pointed teeth and glimmering eyes, demon seemed a fitting description. And a little later on, Welch provides some more description of her demons. I would never call a demon cute. Incredibly handsome. Charming. Deadly. Not to be trusted. According to Lynn, they did not blatantly lie but could do so by omission when it suited them. And you could ask them a question and they would answer in such a way that, without exactly lying, they didn’t give you the truth. Tiff stays as far away from these demons as she can, but to her chagrin is partnered with Royal Mortenson, of the Clarion PD to work on the missing child case, and he is a demon. While wishing that she could shoot him instead of partnering with him, Tiff becomes suspicious of Royal, who has been moving from police department to police department, never staying too long in one location. She suspects that he may be involved in this missing children case from an inside perspective. Linda Welch pens a engaging tale, full of action and adventure. A definite page turner full of twists to keep you guessing until the end. Originially reviewed for the Lulu Book Review. I can't add anything to the previous reviews accept to say that I love a good ghost story and this is far more than that. It is an easy read that is impossible to put down from the very first sentence: "'There's a naked woman in the garden,' said Jack." I devoured it in three evenings and am hungry for more! The protagonist and storyteller, Tiff, is not just a tough and fearless, but an extraordinary woman: she can see and hear the violently slain. This would be enough substance for more than one book, but it’s just the beginning. As strong women go, she has some trouble with her love life, and she seems to tend to collect unusual friendships. The story starts as an easy read with some funny and surprising ideas, but quickly takes up speed and tension becoming an edge-of-the-seat thriller that refuses to be put aside unfinished. The most scary thought about this book is that it might be partially autobiographic. Bring on the rest of the series! because it means that they're already dead! She's not a forensic psychologist or a crime-scene investigator - her talents are much more unique and bizarre. Unlike the many charlatans and pretenders on TV Tiff really CAN talk to the dead - the violently deceased whisper to her, and that can make it difficult to lead a normal life! Enter a sinister world just beyond the everyday streets and homes of quiet little Clarion - a world inhabited by the souls of the slain, awaiting justice for their murders. And other, darker beings not of the mortal Earth... things that Tiff calls Demons, but who have their own Machiavellian hierarchies and intrigues. This is a great read - punchy, engaging and flowing prose which outlines a novel approach to the psi-thriller genre. Plenty of twists and turns, humor and tension, action and intrigue... and the best part is, this is just the first of a planned series! Go on, get this into your hard drive, your book shelf, and your head!